Can you explain the growing interest in Americans with Disabilities Act (ADA) compliance with regard to dryers? One reason is because, until recently, the technology simply was not available to produce a high-speed, wall-mounted, ADA-compliant hand dryer, and managers were hesitant to recess units into wall’s because of cost, installation, time and maintenance. However, these days there are performance dryers that do not protrude more the 4 inches from the wall. The Department of Justice’s revised regulations of the Americans with Disabilities Act of 1990 (ADA) in 2010 spurred the interest. In the past, due to their compact size design limits, traditional ADA hand dryers were not high speed. Today, high-speed, surface-mounted ADA hand dryers are offered. As more facilities recognize the sustainability pitfalls of paper towels and transition to hand dryers, it is inevitable that there will be a greater interest in these dryers and consideration for the environments in which they can be used. What should facility executives look for in hand dryers when purchasing ADA-compliant hand dryers? The American Disabilities Act requires hand dryers to not project more than 4 inches from the wall. This requirement is intended to help protect visually impaired persons from accidentaly walking into the dryer. Accessories that enable recessed mounting are available for some model hand dryers to bring them into compliance with ADA requirements, while other models are specifically designed to be surface mounted ADA compliant. To minimize installation costs, facilities should consider hand dryers that are advertised as surface-mounted ADA compliant. “Hands under” type dryers are typically mounted with the bottom surface 32 to 46 inches above the floor. “Hands in” type dryers are typically mounted with bottom surfaces less than 27 inches above the floor and are not restricted in the depth of projection from the wall. Mounting height and protrusion are the most important factors. 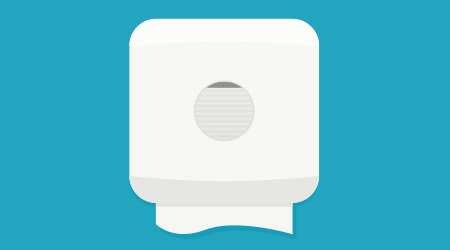 The key dimension to achieve ADA compliance is the depth of the hand dryer from the wall. It must protrude no more than 4” (10 cm). Many dryers are unable to be ADA compliant due to bulky motors that cause them to protrude too far from the wall. As a result, they are often recessed into the wall, which can be costly. Most dryers are ADA compliant when installed properly. Facility managers should also make sure the manufacturer offers ADA accessories that help achieve ADA compliance. For example, a wall guard reduces the water moisture on the walls and floor and achieves ADA compliance. There are also recess kits that reduces the protrusion of the dryer to less than four inches. Nothing in a circulation path of a restroom can protrude more than 4 inches from the wall that is above cane height (15 inces from the floor).